Our expert coach, Neil MacPherson, will be taking a look at common issues that face many Triathletes. What makes these issues difficult for athletes to address is that often there is confusion between the symptom and cause. To give an example of this. Triathletes who come to Dinamic Coaching to do a swim analysis, are asked to explain in their own words what issues they think they have. In many cases they will highlight a weak kick. More specifically they will mention that their legs are low in the water and that they need a wetsuit to address this. Another kick issue which is self diagnosed is a scissor kick. It may surprise a lot of you to hear that in reality the symptoms they are describing is often caused by a number of factors that have very little to do with the intensity, speed or power of the kick. What they are focusing on is the symptom not the cause. So before we start looking at the cause of this behaviour let’s consider for a moment the impact it is having on the swimmer. Swimming is heavily dependent on technique and this is because of what I call Physics 101. 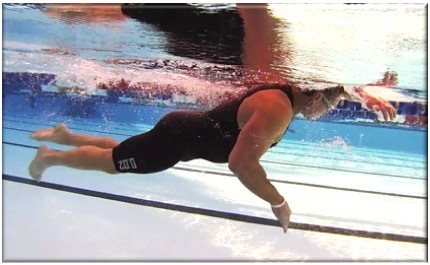 To maximise you efficiency in the water you need to minimise drag and if your body position is putting your body into a place where you are exposing more surface area then you are increasing drag. Think about it, you are driving in your car, you put your hand out with your fingers pointing forward and you experience little resistance, tilt your hand up and the increase in pressure is huge. 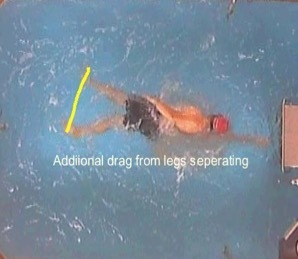 So also with swimming, having your body at an angle is creating massive drag and is therefore requiring more energy to move the person through the water.